InVogueJewelry: "Moss Aquamarine": What Is It? Why So Mysterious? "Moss Aquamarine": What Is It? Why So Mysterious? I've seen a lot of "Moss Aquamarine" lately, not just on Etsy (although most of it is on Etsy), but some jewelry designers are using it as well---one high-end designer who sells at Saks has a Moss Aquamarine necklace for sale, upwards of $750 (although there are other gemstones in the necklace as well). I first noticed this "moss aqua" a couple of years ago, and its popularity seems to have grown. But what is it? I've searched online, and contacted my "usual" gemologists, and I haven't found much about this stone. In fact, my gemologists have never heard of it! Of course, they've heard of "Moss Agate" but not "moss" Aquamarine. 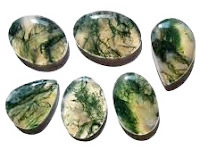 Moss Agate is translucent or transparent chalcedony quartz that has moss-like inclusions inside. These inclusions are green minerals, such as iron or manganese, which formed in "blooms" in the quartz. But the "moss aquamarine" that I've seen has little dots or specs of dark stuff inside the stone---not really anything like moss agate. I searched every reputable gem website, and there is absolutely no information about anything called "moss aquamarine". The GIA never heard of it. Nothing at the Institute of Colored Gemstones. Nothing about it on mindat.org which is a website that is "the world's largest public database of mineral information". Nothing at places like Riogrande.com. Google has nothing with the exception of a question someone posed on a website regarding "what is moss aquamarine?" and the responses were---"never heard of it." I even searched on QVC, HSN and JTV and even they don't offer it. Yet strands or cabochons of this "moss aquamarine" can mostly be found for sale on Etsy, or from some wholesalers in India, and on Ebay. 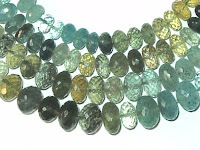 I have been unable to find "moss aquamarine" loose stones for sale anywhere else. Is this a real gemstone? Or is this one of those "creative marketing" things? Well first of all, it's my favorite gemstone! It's a blue-green Beryl gemstone, as its name implies ("sea water") and many jewelers consider it to be a precious gemstone (rather than semi-precious), just like Goshenite (clear Beryl) is a precious gem. The most "famous" Beryl gem is the beautiful Emerald, which of course is green, and is a precious gemstone. Sometimes Aquamarine is kind of a pale grey-blue, sometimes more like Swiss Blue Topaz, and sometimes more of an aqua green color. Like any gemstone, there are grades of Aquamarine. Beryl can be found in other colors. In its purest form, it's colorless and known as precious Goshenite. 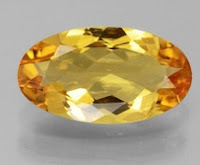 It can also be pink (known as Morganite), or bright yellow to dark golden---"golden beryl" describes the brighter yellow, and Heliodor is a deeper golden color to brown, and is highly collectible. The rarest color is red, and is known as Bixbite. 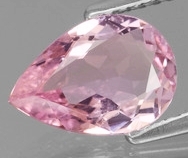 Beryl gemstones are expensive, with huge ranges in price depending on the quality of course. Aquamarine grows in huge, transparent crystals, as well as smaller crystals, but most Aquamarine is very transparent. Green Aquamarine is heated to rid the crystal of green tones and it produces the more desirable blue colors. It appears to be a very low quality, like B or C grade, Beryl that is more green in color (more green than blue), lots of inclusions, and small specs of Iron within the stone. I have seen some lighter colored "moss aqua" which I assume was heated to remove the green color, or perhaps irradiated. 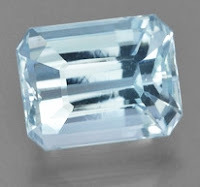 This takes in the assumption that this is, in fact, aquamarine---no one has done any tests on this stone, so really it's just based on what wholesalers are telling consumers, that it's a type of aquamarine (or even beryl). To summarize, this seems to be a low-grade blue Beryl that has iron inclusions, and has been given the marketing name of "Moss Aquamarine". This was probably chosen because "Moss Agate" is a popular stone, even though "Moss Aqua" doesn't have any moss-like inclusions. This appears to be a successful marketing effort to promote a very low quality Beryl---and this is assuming it's even a Beryl gem. This stone is mostly found on Etsy and is a very affordable choice. Wholesale individual faceted pears, for example, seem to cost around $1 or $2 per stone (10mm x7mm in size). Wholesale rondelles seem to run about $16 a strand and up. So the affordability of this gemstone, along with the name "Aquamarine" is appealing. Plus, a lot of people like the "earthy" or "rustic" quality of this gemstone. It makes a gemstone seem less "pretentious" and has its own charm. And it's always nice to own an aquamarine, the birthstone of March, and this is a more affordable version of this gem. I would say---buyer beware on this stone! This is definitely "creative marketing" of a type of low-grade gemstone, using the buzzwords of "moss" and definitely "aquamarine" which is a precious gemstone. Just because it's popular and fills a marketing niche, that doesn't mean it is what others claim it to be. Until someone has this stone tested and verified that it is, in fact, aquamarine, or even Beryl, with iron inclusions, I would be careful buying this stone. In other words, I'm not positive that this is even a low-quality aquamarine or beryl---it really could be anything including quartz or something manmade (like "hydro quartz" glass). It's certainly possible it is a beryl stone, but no one has verified it, and no reputable gemstone website or gemologist even recognizes its existence. To pay many hundreds of dollars for this "moss aquamarine", or even $100, is IMO way too much for this unknown gemstone. If you like the look of this "rustic" included green gem--and many do--then buy it and enjoy it! But I wish jewelry designers and gem sellers would stop trying to cash-in on a popular trend, and instead be responsible and find out exactly what they are selling! But that would require having it tested, and most jewelry designers either just don't think about it, or they don't want to spend the money to have stones tested (which can be very expensive). One final note: Fire Mountain Gems used to sell this "moss aquamarine" but no longer offers it. I don't know why, but I thought that was interesting. 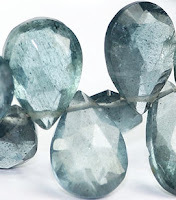 In fact, the ONLY info I could find about this stone---that it's aquamarine with iron inclusions---was found in FMG's google results, but that link to Fire Mountain Gems' moss aqua no longer exists. If anyone finds more information about this gem, please let me know! 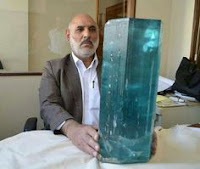 Very green beryl with a LOT of inclusions. Semi transparent in spots, mostly olive green...beryl? Thank you for posting this! This is extremely helpful as I too, was having no luck trying to decipher what this "gem" actually is. I may by a piece just from a "collector's" standpoint. Look at some of the costume jewelry from the 30's 40's and 50's...It not made of any overly precious materials, but it's worth a mint!! Thank you---it's a very mysterious gem! I'm still looking at the ones I bought and I keep hoping I'll like them---but I really don't. They're very muddy and a strange sort of moldy green color--just not pretty! And I LOVE Aquamarine, so I was hoping these would be an affordable alternative. I hope you find some that are more blue and more clear in person! And thanks for your comment! Moss Aquamarine is a truly gorgeous gemstone! However, like most gemstones, there are a lot of low quality stones out there. Looks like you purchased some :-( Sadly, Moss Aqua is fairly rare and is getting rarer because demand is so high. Moss Aqua, by nature is heavily included,with some black specks, (after all it is a natural stone) although this does not take away from the beauty of a quality stone. There are varying colors from ocean blue to teal green although some can be very yellow. I am always looking for moss aqua but lately there is not much to be had. At least the stone is natural, not like the heat treated, dyed, glass filled rubies that are out there. Hope you come across some nice stones out there so you can see what all the fuss is about.Cheers! Thanks for your comment! What mineral is it that causes the black specks? I hope I find some beautiful "Moss Aqua" stones too----I have yet to see any. I bought some very pale blue "Moss Aqua" with specks, and had them tested and they weren't Beryl at all (booo) but were topaz with hematite inclusions! I recently bought some Aquamarines directly from Brazil and I asked the rep about Moss Aqua and they also have never heard of it, or have seen it, I was told. They did mention "Jardin Emeralds" which are emeralds with "garden like" inclusions. Perhaps "Moss Aqua" is found in the U.S. or somewhere else--if you know, please let me know! I was recently at an Art Stroll (Houston), and a lady sells jewelry who is from Bulgaria. She had a ring, moss aquamarine, which I never heard of. It was mossy, not clear, and I was not impressed, but intrigued because I never heard of it. The stone was small, and it was selling for $140. Thanks Dawn and Jewelmaker for any info you have. Yes, I'm not impressed either! I love Aquamarine gems, because they're so clear and that beautiful blue color, but this "moss aqua" is a muddy, weird colored stone and I'm not 100% sure it's a beryl gemstone anyway---I haven't tested it (and lots of gems can have mossy-looking inclusions). Some people love it, but I'm not a fan! And it does seem to be way too pricey! Thanks for your comment---and thank you for reading my blog! What you have is a beautiful Aquamarine, that has tiny inclusions in it. The term "moss aqua" is just made up, meaning there is no actual gemstone called that. It's a "creative marketing" term used for selling really low-quality aquamarine with a LOT of inclusions in it. It's usually extremely muddy and brownish-green overall, with a little bit of blue. If you have a beautiful ocean-blue gemstone with inclusions that you can only see with a loupe, then you've got a very nice Aquamarine! My favorite gemstone!